Are you considering the big switch to modern cloth diapers? Don’t be overwhelmed! One Google search and you will quickly become overwhelmed by all the brands, types, and information out there. Here are a few tips to get you started. 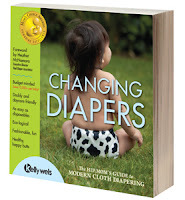 Find a copy of Changing Diapers: TheHip Mom’s Guide to Modern Cloth Diapers. Stay away from Google and read this book first! I wish it had been available when I started cloth diapering. I was so weighed down with all the information I found on the internet, but this book really sums it up plainly in a non-intimidating way! Visit a local baby store that sellscloth diapers. Be careful with this advice. Stores like Target, Walmart, and Buy Buy Baby now sell cloth diapers. These are not the stores I’m talking about! I suggest, if possible, to find a store nearby that sells a variety of modern cloth diapers and is knowledgeable about what they are selling. The employees should be experienced in using modern cloth. Most of these stores will host a free Cloth 101 session. This is how I helped myself, and my husband, understand more about how modern cloth works. The great thing about this tip is you’ll get to touch and play with the diapers and see firsthand what you like. Plug-in to an online community. Join in on the Monday night Twitter #clothdiapers chat. Lots of retailers and experienced mamas are around at 9 pm EST on Twitter to help each other out with any cloth diaper questions. Not only will you learn something, but you may make a new friend or two! If Twitter isn’t your thing, find a message board or Facebook page. There are many great ones out there that can help you navigate the world of modern cloth diapers. Once you are ready to buy some diapers, don’t make a huge purchase just yet! I suggest starting with a very small stash with a few different brands and types of diapers. Just because one brand works great for your best friend doesn’t mean it will be your favorite diaper. Start small and then once you decide what you like, buy more! Don’t give up! Expect to have leaks and lots of questions in the beginning. I remember crying the first couple weeks because my son leaked out of every diaper I put on him. I was tired of changing his clothes (and mine!) with every diaper change and the sheets with every nap. I wanted a cloth diaper fairy to visit my house and tell me what I was doing wrong. When this happens, take a step back and seek help! This is where a local retailer or online community comes in handy. Don’t be afraid to ask for help! We’ve all been there! Just by asking for help I was able to solve my leak problems. Have fun! It’s easy to become a cloth diaper addict. You will quickly develop an obsession for cute prints, colors, and the latest brands. Your friends and family may think you are crazy, but your cloth diaper friends won’t. Jenny is a cloth diapering stay at home mama. She writes about her cloth diaper obsession on her blog, ClothDiaper Revival. This post is provided to Knickernappies via the She Thinks Media Bloggers Network.